My son is a Marine. He was at Parris Island this summer. He was at the School of Infantry during the fall. He was (accidentally) shot there, by another Marine. Fortunately, my son was wearing his flak jacket. The shot knocked him over (he said he thought his Sergeant had shoved him over) and shattered some of the ceramics in the flak jacket, but did not injure him. My son is in Lima Company. This Company has probably had more casualties than any other Marine unit in recent memory, at least in the Ohio area. However, he has not yet been deployed. It looked like he was going to be deployed in April, but those numbers were reduced, so those orders were rescinded. In the past, we’ve seen news stories in which Marine (or other service) units have returned. It was always rather abstract. Yes, we cared, but not intimately. Today, Lima Company returned from their nearly one year deployment in Afghanistan. They’d spent the past couple of months being debriefed, and getting the sort of counseling that helps them re-integrate into . . . tamed . . . society. Today they returned home to Rickenbacker. My son was called merely to do guard duty at the base for their return. Yet, I saw the media coverage of the return of the Marines from Afghanistan. As a parent, I can no longer see it as an abstraction. These Marines have sacrificed a lot. I am happy for their return, and I am overjoyed for their re-union with their families. As the weather improves, I’ve been out hiking quite a bit more. 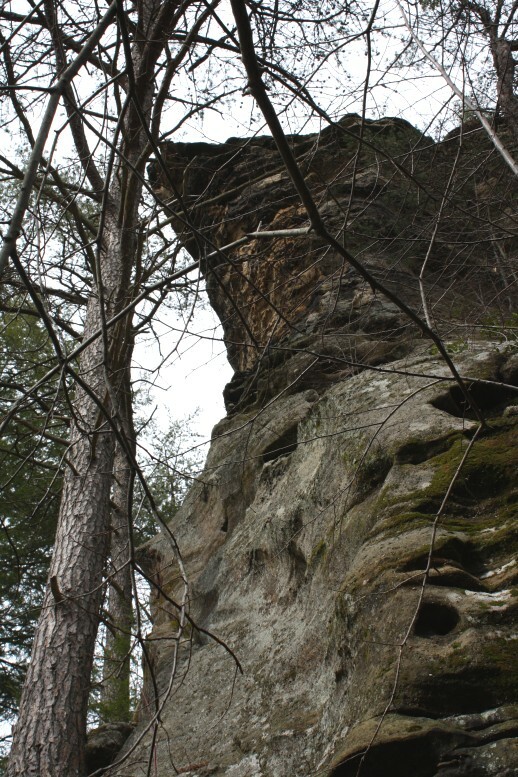 Last week I headed to Parrish Rocks in Hocking Hills. To my eye, this is probably the prettiest waterfall there. Yes, Cedar Falls is pretty spectacular with quite a bit of water volume, but Parrish Rocks is a much higher fall (though it does have much less water). The location is marked on official USGS topo maps. I always wondered about the spelling. Was it maybe named after a church parish (possibly from the wonderment of seeing it)? Nope, not the case. Back in the 1800s the property it was owned by Solomon Parrish (with 2 “r”s). That is undoubtedly where the name came from. Ken Bob Saxton, of The Running Barefoot and the Running Barefoot Yahoo group, has a book coming out: Running Barefoot Step by Step. Ken Bob is the main guru of barefoot running, and he makes the important observation that minimalist so-called “barefoot” shoes are not that good of an idea. When you first start running barefoot, your entire foot is in all likelihood not ready for it: not your muscles, not your tendons, not your ligaments, not your bones, not the skin on your soles. But the skin on your soles is your main sensory organ for telling you when you’ve overdone it. So if you start running with minimalist shoes (they’re not barefoot, goldarnit! and I wish folks, particularly the vendors would quit calling them that), you’ve turned off your early warning system and increased your chance of injuring the rest of your foot. The book officially comes out in May. Here is the Barnes & Noble page for the book, and here is the Amazon one. I had the pleasure of meeting Ken Bob and his lovely wife Cathy while he was touring the country last summer putting on his seminars on barefoot running. What a great and wise person he is to get to know. If you buy just one book on barefoot running, this is the one to get. Tom was the host for a nice dinner when we all met. The little guy, also a barefooter, is Tom’s son Trang. Yesterday was a rather chilly, but clear, day. My son and I took a hike down at Hocking Hills, parking in the Long Hollow parking lot (that’s the lot for the rappelling area). We first hiked over and around Conkle’s Hollow, and then visited Vulture Point and Airplane Rock. It is also that case that during the summer, a whole slew of turkey vultures can be seen rising on the currents throughout the valley. It’s that little white speck in the distance. It’s a quarter of a mile away. 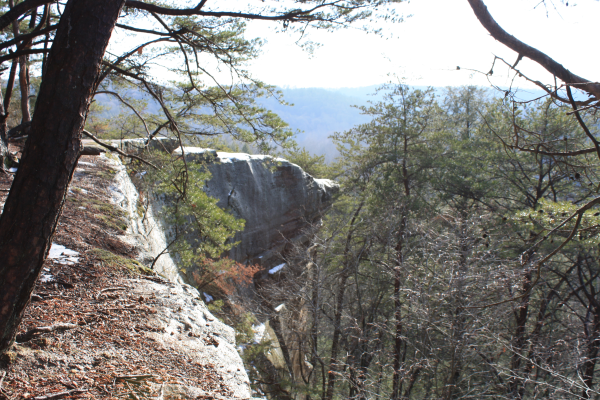 After taking that shot, we scrambled down into the hollow, crossed the creek, and then climbed back up to Airplane Rock. From this picture I took a while ago, you can see why it is called Airplane Rock. This time we made sure to approach it from directly below it, so here is Airplane Rock from underneath. That is quite an overhang. Maybe I should feel more nervous when standing on it. 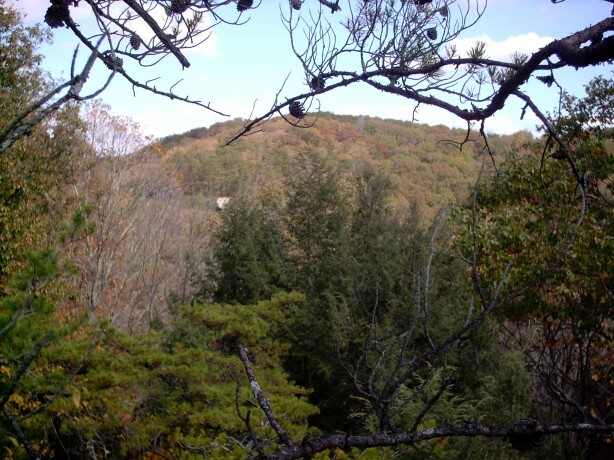 For those of you wanting to know where these two wonders of Hocking Hills are, Airplane Rock is off the Orange Bridle Trail, and Vulture Point is on a side trail (white blaze) off the Orange Bridle Trail. 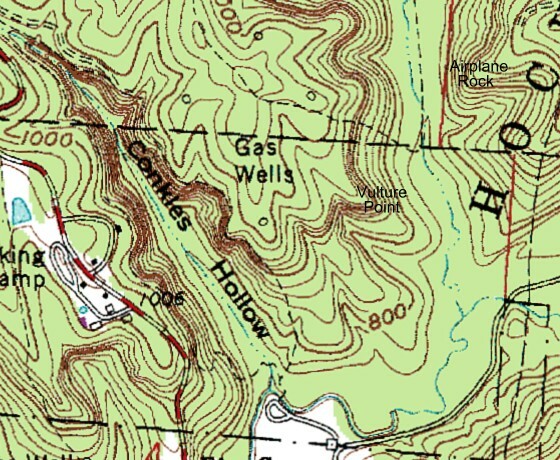 Here is where they are located relative to Conkle’s Hollow. I should note that both of these locations are within the Hocking Hills State Forest. Heading upstream from these locations would take you into the Crane Hollow State Nature Preserve, which prohibits visitor access (so don’t do it!). 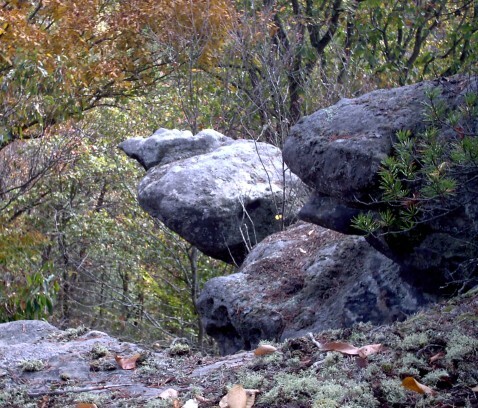 One more anecdote: I hiked the route barefoot — I always hike barefoot. While we were on the rim of Conkle’s Hollow, one person stopped me to ask if she could take my picture with her daughter. She had seen me doing the Hocking Hills Midwinter Hike in January (barefoot, of course — didn’t I just say I always hike barefoot) and just thought it was utterly amazing. In experiments by psychologist Daniel Casasanto, when people were asked which of two products to buy, which of two job applicants to hire, or which of two alien creatures looks more intelligent, right-handers tended to choose the product, person, or creature they saw on their right, but most left-handers chose the one on their left. Admittedly, it is a subtle effect, but it is there nonetheless. How is this related to barefooting? There is no study extending this work to feet, but somehow I just want to think that maybe putting shoes on feet (much more awkward then even a ski glove) can also influence how one perceives good and bad in the world. Maybe that can account for the totally unreasonable reaction that bare feet often seem to elicit. I guess we ought to call it shoddy thinking.